Kalpohin Kamaria JHS - Yo Ghana! ​Kalpohin Kamaria is an Islamic Junior High School founded in the year 2000. The school in Kalpohin village. With a population of less than 100 students and staff of 21, the school has more female students than males. It is one of the most undeserved in the Sagnarigu district of Northern region. The school has started a reading club, a Science and Maths club and a Smart kids club and promises much improvement in the coming days. 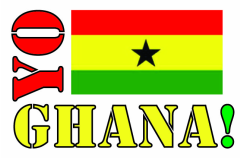 Letter exchanges with Yo Ghana have also been an exciting experience for students.